Although the 2017 Notice directly references ruling letters related to the offshore drilling industry, none of those letters pertain to the actual performance of drilling operations. The Notice supports the notion that drilling operations conducted when a MODU is stationary cannot themselves violate the Jones Act, and IADC has requested that CBP confirm the accuracy of that view in any final action it takes. IADC is concerned about the Notice’s treatment of “vessel equipment” and how that term might be applied to items carried on MODUs traveling from location to another. The Notice’s restrictive view of “vessel equipment” could have direct and immediate implications for MODUs now operating on the Outer Continental Shelf. IADC requests that CBP clarify that “vessel equipment” include items on MODUs that are “necessary and appropriate…for the navigation, operation or maintenance of the vessel and for the safety of the persons on board,” including items such as drilling mud and chemicals, risers, well control equipment, drill string and other equipment necessary for the operations and critical to the safety of the MODU and it’s crew, property and the environment. To access further information about the Notice, please visit the CBP website. To access IADC’s letter, please visit the IADC website. IADC and its members look forward to working with the Administration to streamline regulation and remove requirements that are not cost-effective. On 6 April, Interior Secretary Ryan Zinke appointed Katharine ‘Kate’ McGregor as Deputy Assistant Secretary for Land and Minerals Management. In this role, she will oversee the Bureau of Land Management, Ocean Energy Management and Safety and Environmental Enforcement. In her last position on the House Natural Resources Committee, she worked with both industry and IADC. The three Interior Departments she oversees still await new directors. EPA Administrator Scott Pruitt has initiated a review the agency’s oil and gas new source performance standards to determine if they are duplicative and also moved to stop the methane collection request that was initiated under the Obama administration. On 28 April, Congressional lawmakers voted on a one-week budget extension – a stopgap bill -to avert government shutdown. This will give lawmakers more time to complete negotiations on the 1 trillion dollar measure. Federal subsidies that help low income Americans pay for health insurance on the Affordable Care Act became the latest sticking point for reaching an agreement on the spending bill to fund the government through September. Earlier the same week President Trump backed off on immediate funding of a border wall to Mexico after it was clear that there were not enough votes for it. In May, the Senate is expected to vote on a measure that will repeal the BLM Methane Rule, which aims to curb greenhouse gas emissions from oil and gas flaring, venting and leakage on public and tribal lands. In order to overturn the rule using the Congressional Review Act (CRA), lawmakers must hold a vote prior to 10 May, otherwise BLM will be responsible for undoing the rule, a regulatory process that can take months and could face legal challenges. Legislation was recently introduced by Louisiana Senators Bill Cassidy and John Kennedy and Virginia Representative David Brat to bar any President from using the Outer Continental Shelf Lands Act and Antiquities Act to block offshore energy development and production. The Outer Continental Shelf Energy Access Now (OCEAN) Act and the Unleashing American Energy Act of 2017 direct Interior Secretary Ryan Zinke to review moratoriums and future leasing schedules. 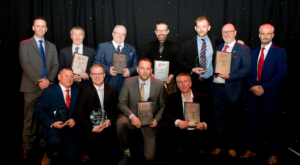 On 21 April, the IADC North Sea Chapter recognized the best in safety performance at it’s annual Safety Awards Ceremony. The award for best safety performance in the jackup category for 2016 was awarded to Ensco, with Paragon Offshore as the runner-up. Awilco Drilling was recognized in the floating rig under 500,000 manhours category and Diamond Offshore in the over 500,000 man-hours category. The winner for platform drilling was KCA Deutag. Chairman’s Awards, which recognize individual rigs and their crews with the best safety performance in 2016, went to Ensco 121; Ocean Valiant; Diamond Offshore; and Scott, KCA Deutag. The Associate Member award was presented to Weatherford UK. For more information about the North Sea Chapter, please visit the IADC Website. Back row from left are Jason McFarland, IADC President; Ivor McBean, Diamond Offshore; Dale Stringer, Ensco; Stephen Kidd, Weatherford; Ed Wheler, KCA Deutag; Jim Paterson, KCA Deutag; and Gary Holman, Awilco Drilling. Front row from left are Scott Ewen, Diamond Ofshore; Gavin Carlile, Ensco; Jeroen van Wettum, Paragon Offshore; and Mike Brumfield, Awilco Drilling. Eni S.p.A. Upstream & Technical Services of Milan, Italy is the latest operator to join the IOGP/IADC BOP Reliability JIP. Eni’s participation brings the total number of companies in Phase II of the JIP to 30. The JIP was officially launched in early 2016, utilizing a platform originally developed by seven drilling contractors which began collecting BOP performance data is 2015. Phase II of the JIP, which collects data for surface as well as subsea BOPs, kicked off in September 2016. Participating companies consist of 16 drilling contractors, 11 operators and three equipment manufacturers. Phase II of the JIP is currently still open for a limited time to onshore and offshore drilling contractors and operators. Thursday, 4 May: IADC Executive Vice President Mark Denkowski will participate on a panel discussion about competence and human factors during the Center for Offshore Safety (COS) breakfast at 7:30 a.m. in Room 300. The panel discussion, “Managing the Human Side of Safety – Strengthening Offshore Safety Culture”, will allow presenters from Shell, BP, IADC, COS and NAS to discuss their approaches to reinforcing and strengthening offshore safety culture. Thursday, 4 May: IADC will join with IBP to sign a Memorandum of Understanding (MOU) between the two associations, pledging to support each other and collaborate to continually foster education and communication within the upstream oil and gas industry in Brazil. Milton Costa of IBP and Jason McFarland, President of IADC, will sign the MOU at the IBP booth, S3, at 10 a.m.
For more information, please visit IADC’s booth, S15, located in the NRG Center lobby. On 11 April, Texas Governor Greg Abbott appointed Railroad Commissioner Wayne Christian to serve as the Official Representative of Texas to the Interstate Oil and Gas Compact Commission (IOGCC). The IOGCC is one of the oldest and largest interstate compacts in the U.S., working to ensure the nation’s oil and natural gas resources are conserved and maximized while protecting health, safety and the environment. It was formed more than 80 years ago when several states joined together to resolve common issues in the industry without federal intervention. Membership comprises the current governor of each member state, as well as additional representatives appointed by governors. The IOGCC serves as the governors’ collective voice on oil and gas issues and advocates states’ rights to govern the petroleum resources within their borders. As representative, Commissioner Christian’s responsibilities will include serving as spokesman for the group in Texas, meeting with the Governor to discuss current issues, authoring/sponsoring IOGCC resolutions, voting during business session, participating in committees and regularly attending meetings. During OTC Week in Houston, 1 May through 4 May, IADC will host a context on its social media platforms, and will give away a free set of the IADC Driller’s Library, valued at $1,773. For a chance to win, attendees at OTC are encouraged to stop by IADC’s booth (S15 in NRG Center) and take a photo of themselves with any one of the five books from the Driller’s Library. Post the photo on LinkedIn, Facebook and/or Twitter using #IADCOTC2017, for a chance to win. One winner from each social media platform will be chosen from the photos posted – posting a photo on each platform qualifies for three chances to win. Photo must be posted between Monday, 1 May and Thursday, 4 May. Winners will be notified the week after OTC. IADC will air a virtual panel discussion on 6 June on Gateway, IADC’s program to assist the industry build the workforce for tomorrow’s drilling industry. The pre-recorded VPD will air at 10.00 CDT. The drilling industry faces a unique challenge today when it comes to recruiting the right people for the right roles, just as the industry is beginning to recover. Demand for workers with a higher level of technical skills is increasing, just as an entire generation of veteran employees retires. The modern drilling workforce must train to fill these roles, as well as to develop the next generation of operations and technology. IADC’s Gateway program brings together industry and educational institutions to strengthen industry’s ability not only to find new employees, but to ensure that those people are prepared for life on a rig, can contribute to the safety culture, and will achieve competence quickly. To register for this free VPD, go to http://www.drillingcontractor.org/vpd-registration-examining-gateway-iadcs-training-program-new-employees. For more information, contact mike.killalea@iadc.org. Lyndol Dew of Diamond Offshore Drilling was confirmed as the new Chairman of the Well Control Institute on 16 March. Mr. Dew is Senior Vice President of Special Projects and Strategic Initiatives for Diamond Offshore, and is a charter member of the Board of Directors of the Well Control Institute. He is also a member of the IADC Executive Committee and Division Vice President for the Offshore Division. Mr. Dew graduated from Florida State University and received a Master of Engineering from Tulane University. He served in the U.S. Navy as a Surface Warfare Office for six years before subsequently working in various domestic and international positions for Diamond Offshore, on rigs and shore-based, for the past 32 years. The Well Control Institute is a wholly owned subsidiary of IADC and focuses on improving well control performance in drilling operations worldwide. Its Board of Directors is made up of high-ranking executives from the world’s leading drilling contractors, oil companies, service companies and equipment manufacturers. The ART DCS Subcommittee has launched a survey to assess contractors’ attitudes about data quality, sensor integrity and how the ART Committee can help. Recently operators have launched an initiative to improve data quality and sensor integrity in drilling and also to include provisions to that effect in IADC model form contracts and other such agreements. Please visit the Drilling Contractor website for a video interview on this topic with Michael Behounek, Senior Drilling Advisor at Apache Corp and Co-Chairman for the Operators Group on Data Quality, and an article, “Operators Group Proposes Data Contract Addendum to Effectively Unlock and Utilize Drilling Data”. More information can be found in the Drilling Contractor article, “Drilling to the Limit: Operators Group for Data Quality Aims to Create Common Specifications”. The three-question survey is at http://www.iadc.org/survey-dcs-042017/. Anonymous responses are fine, though contact information is appreciated. All contact information will be confidential, although IADC might follow up. Contact mike.killalea@iadc.org for more information. Please join the Subcommittee at the next meeting to participate in or learn more about the progress of these guidelines. The next meeting will be held on 11 May at IADC Headquarters in Houston and the subcommittee will also be joined by Jim McCarthy, from NIST NCCoE to discuss ONG Use Cases. If you plan to attend, please register online via the IADC Website. Attend the 10 May meeting of the IADC Advanced Rig Technology (ART) Committee at IADC headquarters in Houston. Attendees will hear about proposed data-quality addenda to IADC Model Form Contractor; hear a summary of results from the recent survey on data quality; discuss subcommittee creation and consolidation; review the 5 April Spark Tank and plan for future events, as well as hear report outs from ART subcommittees. The 2017 IADC ART Conference, 24-25 October, Amsterdam. Register for the ART committee here: http://www.iadc.org/event/iadc-art-committee-12/. Contact mike.killalea@iadc.org for more details. The ART BOP Controls Systems Subcommittee, under the leadership of its chair, Roy Mills of Noble Corp, met on 25 April to continue development of guidelines for SPM and shuttle valves. At the recent meeting, the subcommittee worked on recommendations for hydrostatic and endurance/durability testing. The goal is to produce a final draft of the guidelines by year end. Next meeting: 23 May, at IADC HQ. Contact mike.killalea@iadc.org for details. The IADC ART Committee held a Spark Tank on 5 April. The ART Spark Tanks are forums where new and developing technologies (“sparks”) are presented to a panel of operators and contractors (“sharks”), who provide positive (or negative!) feedback to the presenter. Sharks were Joey Husband, Nabors Industries; Paul J King, Transocean; and Taylor Thetford, Apache Corp. ART Chairman Robin Macmillan, NOV, moderated. The next Spark Tank will convene on 2 August at IADC HQ Copies of presentations from the 5 April Spark Tank are available at http://www.iadc.org/wp-content/uploads/2017/04/5-April-2017-ART-Future-Technology-Spark-Tank-Mtg.-Minutes.pdf. Contact mike.killalea@iadc.org for more information. IADC’s Technical Publications Committee met on 27 April at IADC HQ. The committee, chaired by Dr Leon Robinson, discussed progress of several books now under development. The TPC meets next on 27 July at IADC HQ. In addition, TPC authors were on hand to sign books at IADC’s booth at the recent general meeting of the American Association of Drilling Engineers in Houston on 11-12 April. Authors were Dr Leon Robinson, Juan Garcia, Ron Sweatman and Les Skinner. The TPC is also looking for authors for proposed books! Contact loretta.krolcyzk@iadc.org for more information. API Specification 16A, Specification for Drill Through Equipment, Fourth Edition, was recently published by API. The specification defines the requirements for performance, design, materials, testing and inspection, welding, marking, handling, storing and shipping of drill-through equipment used for drilling oil and gas. Specifically, the document applies to the manufacture and testing of ram blowout preventers; ram blocks, packers and top seals; annular blowout preventers; annular packing unit; and associated connectors. It also defines service conditions in terms of pressure, temperature, and wellbore fluids for which the equipment is designed. To access the document, please visit API’s website. API recently published Standard 18LCM, Product Life Cycle Management System Requirements for the Petroleum and Natural Gas Industries, First Edition. The document defines the requirements of a management system for service providers performing life cycle management of products for organizations in the petroleum and natural gas industry. It identifies requirements for service providers of life cycle management and the activities required to perform product life cycle management including determination of product life cycle management status, actions required to maintain a status and development of the life cycle management plan. The document was developed for application to upstream activities and is intended for pressure-containing and/or pressure-controlling products for wellbore fluids, but may also be applied to other equipment that is specified by the product owner or customer. API Standard 16AR, Standard for Repair and Remanufacture of Drill-through Equipment, First Edition, was recently published by API. The standard specifies requirements for repair and remanufacture of drill-through equipment built under API 16A. Specifically, the standard is applicable to and establishes requirements for, the repair and remanufacture of ram blowout preventers (BOPs); ram blocks, operators, packers, and top seals, annular BOPs; annual packing units; and associated connectors. To access the API Standard 16AR, please visit the API website. The IADC Daily Drilling Report has been a staple of the drilling industry since it was introduced in the 1950s. IADC seeks your input on how to improve both the paper and the electronic versions of this important oilfield tool, and will issue a survey in the coming weeks. If you have any comments in advance of the survey, please provide them to mike.killalea@iadc.org.